Synopsis: There is a 50-55% chance of El Niño onset during the Northern Hemisphere fall 2018 (September-November), increasing to 65-70% during winter 2018-19. ENSO-neutral continued during August, as indicated by a blend of slightly above- and below- average sea surface temperatures (SSTs) across the equatorial Pacific Ocean. Over the last month, the westernmost Niño-4 region was the warmest (latest weekly value was +0.5C), while the Niño-3 and Niño-3.4 regions were weakly positive, with Niño1+2 remaining negative. Subsurface temperature anomalies (averaged across 180°-100°W) were positive, with an increase in above- average subsurface temperatures in the central Pacific and slight expansion of negative anomalies in the eastern Pacific . Convection returned to near average over the Date Line, and was slightly enhanced over Indonesia . Low-level westerly wind anomalies re-developed across the east-central and western Pacific, although they were only slightly evident in the monthly average. Upper-level wind anomalies were westerly over the eastern Pacific. Overall, the oceanic and atmospheric conditions reflected ENSO-neutral. 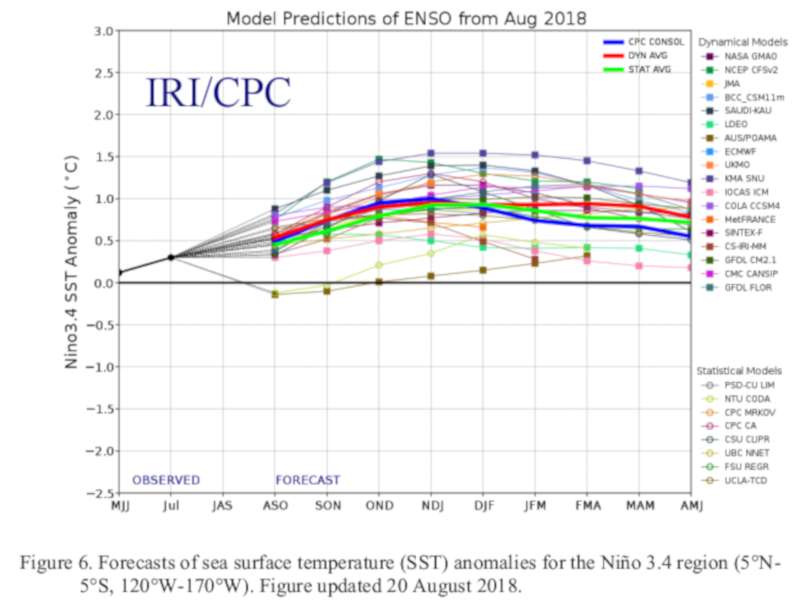 The majority of models in the IRI/CPC plume continue to predict the onset of El Niño sometime during the Northern Hemisphere fall and continuing through the winter. The forecasters also favor El Niño formation during the fall, and are leaning toward the more conservative model guidance that indicates a weak El Niño event. The persistence of above-average subsurface temperatures and continuing flare-ups of westerly wind anomalies also support the eventual development of El Niño. In summary, there is a 50-55% chance of El Niño onset during the Northern Hemisphere fall 2018 (September-November), increasing to 65-70% during winter 2018-19 (click CPC/IRI consensus forecast for the chance of each outcome for each 3-month period).